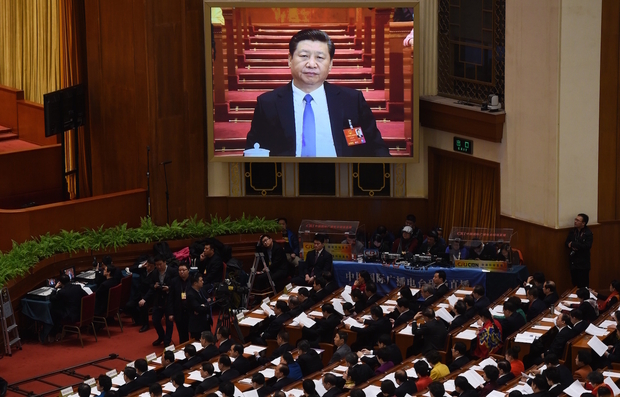 Chinese President Xi Jinping is seen on a screen above delegates during the second plenary session of the National People’s Congress in the Great Hall of the People in Beijing on March 9, 2016. We must look back with equal measures of humility and wonder to the time when many journalists, Chinese intellectuals, and pundits predicted—or, more accurately, hoped—that incoming President Xi Jinping would lead an era of reform that would even touch on the political sphere. That was a time when Weibo was a cacophony of comment, when newspapers pushed the boundary of what had been acceptable, and when public discourse seemed an escape-valve for pressures and tensions within society. Now, three years after Xi became president, we see a fundamentally changed environment. Commentators, protesters, feminists, lawyers, journalists, activists—the list of those arrested, detained, jailed, silenced, and threatened is long. Censorship in both new and old media spheres is tight. Beyond the obvious conclusion that guesswork and wishful thinking about China and its leaders are usually wrong, what happened? The company he keeps. Xi fundamentally is conservative and controlling; this is made very clear by the appointments he makes. Simply take Lu Wei, the Internet Czar—in all my dealings with him when he was at Xinhua and I was at Reuters it was clear he was absolutely unyielding, tough, and nationalistic. No one would appoint someone like him to a job like that without knowing precisely the kind of heavy-handed line one would get—and wanting that badly. The Party he has. That Xi sees existential threats to the Communist Party in corruption and disloyalty is clear, yet he wants to preside over a triumphant 100th anniversary of the Party’s founding in 2021. In that context, this week’s stunning misprint by the official Xinhua agency that called Xi China’s “last” leader instead of its “top” leader is both poignant and a pointed reminder to him of the need to keep the press in line. In classic Sinological tea-leaf reading terms, the very fact Xi had to demand that the media be of the Party’s family (“be surnamed Party” 姓党) is a clear sign that it is currently not. The economy he wrestles with. It was easy to allow financial media (Bloomberg, Reuters, and The Financial Times from the West, Caijing and Caixin internally—to give just a few prominent examples) to be relatively free to publish in China when the news was seemingly always good. But once politics and economics become ever more intertwined and the news became bad if not dangerous—slowdowns, layoffs, protests, currency questions—then, to a man like Xi, the need to control, rectify, and regulate the media and the commentariat became urgent. And, finally, the effect that it has. A well-functioning media and commentariat (regardless of whether the surrounding society is free or democratic) provides an important measure of transparency and accountability. Without that—as this essay itself proves—we are reduced to guesswork, assumptions, and the tired tea-leaf reading tools of Sinology. I agree with David that part of the goal of the current crackdown may be to close the black box that social media, especially Weibo, opened in the early years of this decade. But, as Xiao Qiang pointed out in a previous Conversation, resistance to “rule by fear” can temper censorship, and even directly challenge it. In the past few weeks, we have already seen a backlash against increased censorship from independent media, as well as from employees of state media. At the start of the China’s annual legislative sessions this month, the influential media organization Caixin published an interview with Chinese People’s Political Consultative Conference delegate Jiang Hong, quoting him on the need for non-Chinese Communist Party members such as himself to freely give suggestions to the government. On March 5, the Cyberspace Administration of China ordered that the article be removed because it included “illegal content.” Caixin complied, but then noted the incident in an English-language report a few days later. That article came down, too, but its very existence is remarkable, a “bold and rare” move, according to the China Media Project’s David Bandurski. Caixin is known for probing the murky borders of China’s censorship. But Caixin, and all other media in China, must exist in that dim zone of the permissible. State media are even more circumscribed, as we were reminded when China Central Television (CCTV) declared that its surname is “Party” during Xi Jinping’s inspection of its headquarters in February. But some individuals from state media are pushing back, too. A few days before that visit, Chief Editor of the Global Times Hu Xijin called for the government to be open to “constructive criticism” and to have a “certain amount of tolerance for unconstructive criticism.” More notably, a Xinhua employee published an open letter last week lambasting media and Internet censorship, and comparing the purge of tycoon-turned-commentator Ren Zhiqiang from social media and subsequent denunciation of him “a kind of Cultural Revolution-style mass criticism.” Political cartoonist Kuang Biao drew the same comparison between Ren’s current situation and “struggle sessions” 50 years ago. There are always more intense censorship controls around important national events. Excess censorship in relation to the recent legislative sessions (liǎnghuì / 两会), including crackdowns on virtual private networks (VPNs), the blocking of more foreign websites (such as scmp.com), and overbearing domestic information controls, as described in the introduction to this conversation, are par for the course. In contrast to past sensitive events, we are unlikely to see any loosening of these restrictions. Circumvention tools will continue to work sporadically, websites will remain blocked, and criticism of the authorities on domestic social media will stay silent. What is different in this case, encouragingly, is the proliferation of pointed criticism from prominent voices of dissent. This clearly illustrates the widespread level of discontent with censorship at all levels of Chinese society. These outspoken voices can be in part to blame for this recent storm surge of censorship. The authorities can see that the tide is rising and they are desperately working behind the scenes to add sandbags on top of the Great Firewall. Despite the crackdowns and arrests, I cannot help but feel somewhat optimistic about an imminent end to censorship controls in China. When voices speak out and are heard, even if only for minutes before censorship kicks in, it lends hope and emboldens others to do the same. Dissent begets dissent while censorship begets free speech. Instead of this being the height (zuìgāo / 最高） of censorship controls in China, could this possibly be the beginning of the end (zuìhòu / 最后)? The banishment of Ren Zhiqiang from China’s social media arena is a continuation of the crackdown on “big Vs”—influential commentators—and the further tightening of controls on speech and public discourse. But different from the previously muzzled big Vs such as American investor Charles Xue and New York Times contributing writer Murong Xuecun, Ren is “a second-generation red”—a moniker for offspring of Communist Party elites—and was long considered a Party loyalist. Therefore, the banishment of Ren as well as the demand of Party mouthpieces to be “surnamed Party” could be seen as part of Xi’s ongoing effort to unify the Party from within. China’s economy is now growing at its slowest pace in a quarter of a century and labor unrest has multiplied as a result. Xi’s sweeping anti-corruption campaign inevitably must have piqued quite a few among the ranks. Facing these challenges outside and inside of the Party, maintaining Party unity is increasingly becoming an imperative for the survival of Communist Party rule.